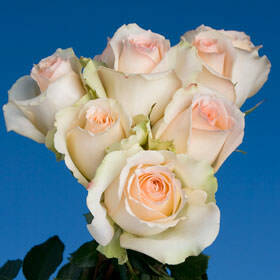 The Versilia Peach Rose is a very gentle and humble floret. Peach has symbolized love and admiration just like pink buds, making them a great alternative or addition to pink bouquets and centerpieces. When decorating your Valentine's Day event or sweet sixteenth party you are sure to create an atmosphere of love, admiration, and fun that others could only strive for. As a corsage it is sure to cause envy as it is a very unique and impressive color that would amplify the beauty of any woman who is to wear it. Bringing nature's beauty to your doorstep is our business but we see it as our duty to allow Mother Nature to keep producing her beauty for all of USA forever. Here at Globalrose we choose to follow some of the most challenging greed standards the industry has. Your floras may not be green but they were grown that way. Your orders were grown in state of the art facilities in Colombia's most pristine locales to insure all year long availability. All of your Peach Rose orders within the continental USA will be free of charge thanks to FedEx our exclusive shipping partner. When you receive your order your buds will closed, please allow seventy-two hours for them to fully bloom.